On March 26, 2007, the Human Services Department began a fundamentally new way of serving clients in their continuing Medi-Cal, CMSP, and Food Stamp caseloads. Two years in the planning, the Economic Assistance Service Center serves about 25,000 cases representing some 50,000 Sonoma County residents. The Service Center operates similarly to call centers that the public commonly encounters when phoning other organizations such as a bank or utility company. There is an automated menu offering choices, such as services in Spanish. 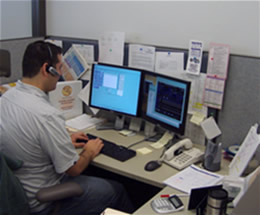 Callers can connect with a live worker right away (the goal is to have at least 80% of calls requesting a live worker answered in 20 seconds or less). Traditionally clients have a 1 to 1 relationship with their eligibility worker. In other words, specific customers are assigned to a specific worker. Under the new model all of the cases will be pooled together so any worker can help whoever calls whenever help is needed. Using a traditional case management model, 40 workers handling 25,000 cases would mean each would be assigned 625 cases, an unrealistically high number to manage effectively. With the Service Center, tasks are assigned to workers as they come; no one worker holds a case on an ongoing basis. Marion Deeds, Economic Assistance Division Director, said “We decided not to call it a ‘Call Center’ because there is a lot more being done than answering phone calls.” In fact, only 15 staff are designated as “Phone Eligibility Workers” the other 25, termed “Case Maintenance Eligibility Workers,” are assigned more lengthy tasks like completing annual Redeterminations, processing reports clients must provide periodically, or conducting face-to-face interviews with clients. The Human Services Department launched the Service Center as a strategy to improve customer service in the face of rising caseloads and limited funding. State and federal funding have not kept pace with caseload growth. With the sluggish economy, Sonoma County has seen the Food Stamp caseload nearly double in the past five years. As health costs have grown (outpacing inflation) it has become more challenging for businesses to offer health coverage as an employment benefit. In the past five years the Medi-Cal caseload has gone up 50%. The Service Center leverages three new technologies to serve customers better. The first is an automated welfare eligibility determination system, CalWIN, which Sonoma along with 17 other California counties is now using to automatically determine eligibility and calculate benefits. The second technology is document imaging. This means that paper coming into the agency, such as a client’s pay stub for example, is scanned into our system and can be retrieved from the desktop of any worker answering the phone in the Service Center. It means the worker will not have to put clients on hold, or call them back, while looking through literally thousands of file folders. Finally, the Service Center takes advantage of advances in telephony technology such as Interactive Voice Response and Automatic Call Distribution routing.